As you may have seen from my last post I am exploring some exciting new artistic approaches to my fine art photography It is quite the adventure and it’s releasing new ways of expression through my art. Why? Because for a long time I had pondered how I could create my artwork in a way that’s even more uniquely my own artistic expression, where my camera became even more the tool and the beginning of a canvas. I have found the answer to my pondering. This year I will be exploring beyond the camera, beyond the photograph to see what’s around the corner, it will be a surprise. Whether this be a particular tone that evoked a feeling, or even simply guiding my viewers eye to a particular place. My camera has always only been the beginning. Now I am able to explore beyond the camera into a whole new adventure of Photo Artistry to express my mission of a sense of place through feeling. I hope to share more about it as I explore further (I am planning that newsletter subscribers get to see some of my fine art photography work in progress – so make sure you are signed up because we are taking a new direction with the newsletter, with regular coupons for subscribers) and I’ll share on the blog and on my recent work on the Portfolio. As always, all my work is available for purchase in a jiffy in the shop and from NickyJameson Photography. Here’s something about my above print – taken from my photo on Flickr – I could not believe how many views, faves and comments this image had, my biggest ever since I’ve been on Flickr. I was, quite honestly stunned on New Year’s Day. Thanks guys, much appreciated. OK, so as a Londoner, one of my favourite pastimes is exploring streets (especially very old streets) where you can’t quite see what’s around the corner – in this case, it’s Ironmonger Lane, which is a narrow one way street and has had this name since around the 12th Century. It runs between Gresham St and Old Jewry, not too far from The Guildhall. For my creation I’ve included my fascination with clocks and timepieces, the passing of time and how important it is for me to use it wisely, explore new frontiers and see where the path might lead. 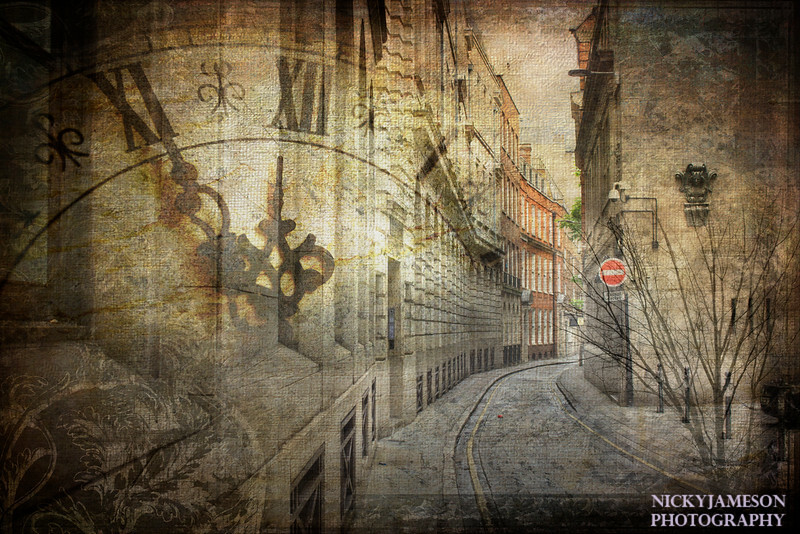 This grungy artwork I created is a composite of three different photographs – taken at different times, my winding street was taken back in 2014, the winter tree was taken very recently. I used several textures, layer masks, brushes, adjustment layers all at different blend modes and opacities. This is going to be one big adventure. I hope you will join me for the ride. Remember locals, that I have regular new work up a the Arts Market Leslieville, 1114 Queen St East, Toronto. We had a great year in 2015, please buy local art and help us make 2016 even greater. Not local? Head to the online shop.